Soak sama for 3-4 hours. Drain water. Soaking helps to cook it fast. Grate potatoes and put it in the cold water. Take a pan and heat oil. Add cumin seeds, ginger paste, green chillies, curry leaves and stir it for 2-3 times. Add 1 ½ cup of water and let it boil. Add salt, turmeric powder, sama, mix it, close the lid and let it cook on the medium flame. Add lemon juice when it is half done. Stir it occasionally to check it. If you think water is less then add about ½ cup of water. It depends upon the brand of sama you are using. Some need less water while some needs more water. Cook it till it is done. 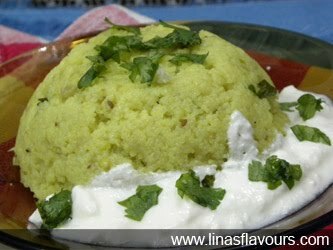 Garnish it with coriander leaves and serve it with curd.